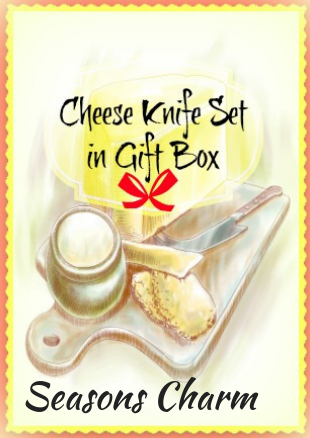 The stainless steel cheese knife set in gift box makes an excellent housewarming gift for cheese lovers. It works great as a wedding gift too. A special knife for each special type of cheese – so cool! If you entertain frequently and serve cheese at your parties, then having a few different cheese knives add that special charming touch to your cheese board. Enjoy your cheese by cutting it right. 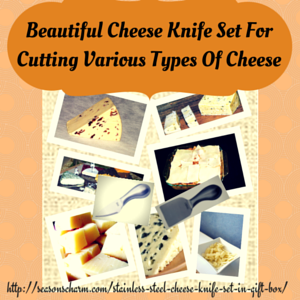 Cheese knives are specially designed for cutting cheeses. They are also great for serving fruits, charcuterie, spreads and other fine foods. 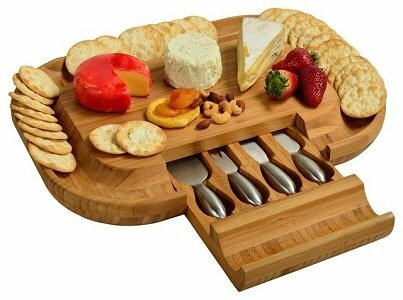 Impress your guests with your cheese knives and board at your next cheese and wine tasting night. Before getting your cheese knife set as gifts, you might want to check out some of the more common types of cheese knives and cheese boards available. Then you’ll have a better idea of which best cheese knife set is to buy as a housewarming gift for your new neighbor or friends. 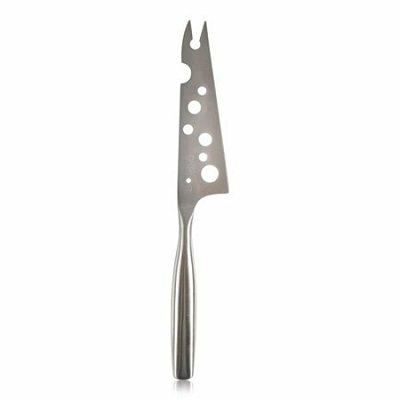 The soft cheese knife comes with holes in its blade or it comes with a narrow blade. This is to prevent cheese from sticking to it while being sliced. It is best used for soft to semi soft cheeses such as Brie. This is like a multi purpose cheese knife, the go-to-tool for cheese. You can use it to cut soft or semi-soft cheeses. The 2 prongs at the tip is handy for picking up pieces of cheese when serving your guests. The holes in the blade minimizes cheese sticking to it. It works great for soft cheeses or cheese spreads. Specially designed for cheddar, use the cheese cleaver for cubing hard cheese such as the Havarti, Colby, Swiss and of course your Cheddar cheese. It is used for cubing harder cheeses. 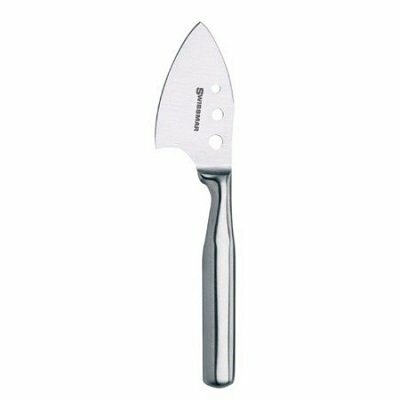 This knife comes with a sharp blade which makes it easy to break apart hard cheeses such as Parmesan, Old Amsterdam, etc. Use a twisting movement to break off chunks of cheese. You can also use the pointed sharp tip to pierce the cheese. Use this knife when you have the urge to snack on Parmesan. 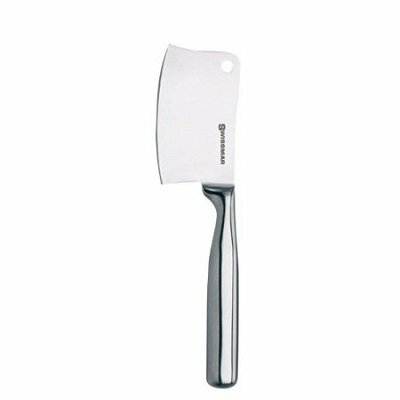 A multi purpose knife that is best used for semi-soft to hard cheeses. It works great cutting soft crumbly cheeses or chipping away at the firm cheeses. It has a sharp bottom edge and works great at shaving down hard cheeses. This is a triangular shaped knife with a slit across the base for cutting cheese into thin slices. 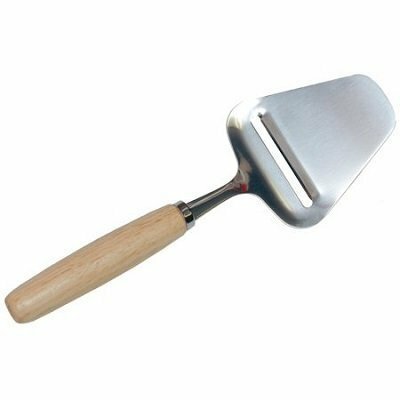 If you fancy thin slices of cheese, then this is the tool to use. The cheese plane is best used for semi-soft (fontina, havarti) and semi-hard (gouda, alpine-style) varieties. 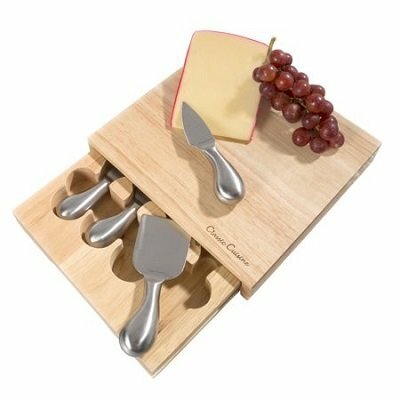 This cheese board gift set by Classic Cuisine includes 4 brushed stainless-steel cheese serving tools and a self contained storage drawer. 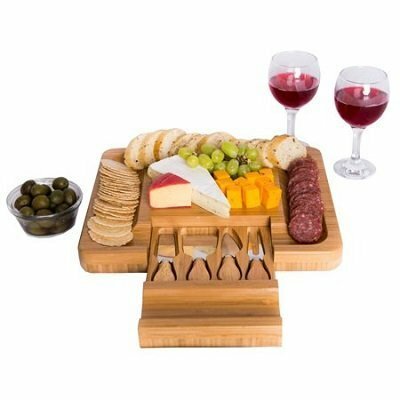 The 4 pieces of cheese serving tools come neatly packed into its self contained drawer with its solid wood cutting or serving board surface. This makes it easy to bring along on your travels. The 4 cheese knives look very modern and sophisticated in design. The cheese tools measure 5″ in length. The serving/cutting board surface measures 8.6″ x 8.25″ x 1.5″. When the drawer is pulled out, the total length measure 16″. Made from 100% natural bamboo, this bamboo cheese board knife set includes 4 stainless steel cheese cutting tools. The large flat bamboo cutting board comes with small round edges for serving. There is a hideaway slide out drawer for storing your cheese tools. Now your tools won’t get lost in your kitchen cupboard. The cheese cutting tools are made of quality stainless steel with bamboo handles. 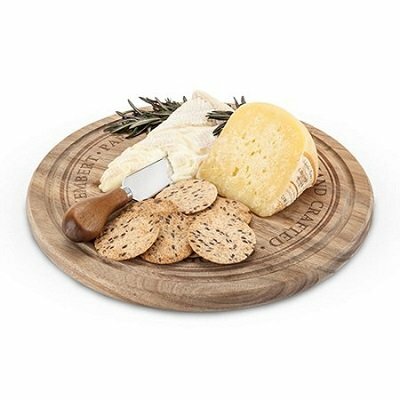 The rectangle wooden server has extra large outer serving rim at the edges for displaying more cheese crackers. The natural bamboo server is cured with an eco-friendly clear coating for a smooth finish. 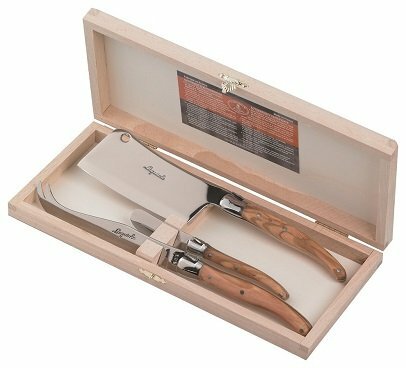 This cheese board and knife set would make a thoughtful gift for any cheese connoisseur. 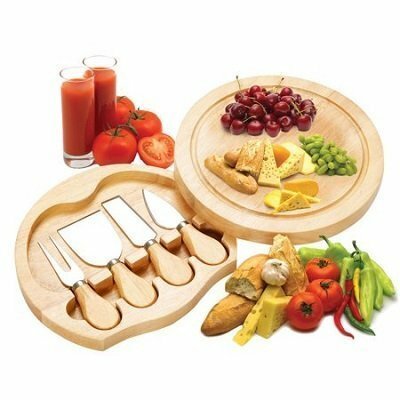 This cheese knife set with round cutting board is made of eco friendly wood. The stainless steel cheese knives come with wood handles. The circular cutting board has an 8.3″ diameter and a thickness of 1.6″. 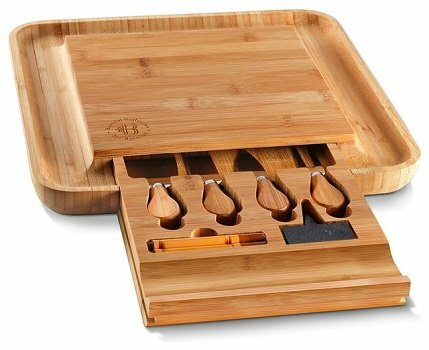 This set features a removable slate cheese board (6″ x 6″) that is nested in an eco-friendly magnetic bamboo tray. An integrated magnetic strip helps to keep the cheese cutting tools upright and at hand. 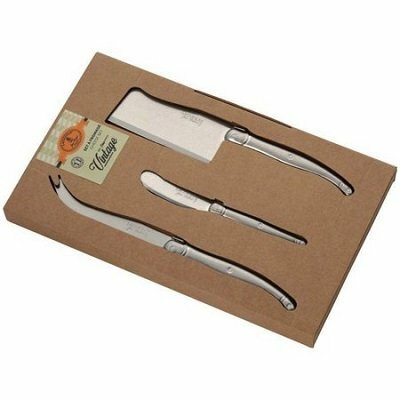 This set includes 3 cheese knives with high grade stainless steel blades and vintage distressed stainless steel handles. There is no cheese board included. Made in France, these rust resistant vintage stainless steel cheese knives come packed in an open-faced gift box. Each blade comes with its own special function. Now you’ll have no problem using the correct cheese knife for the correct type of cheese. 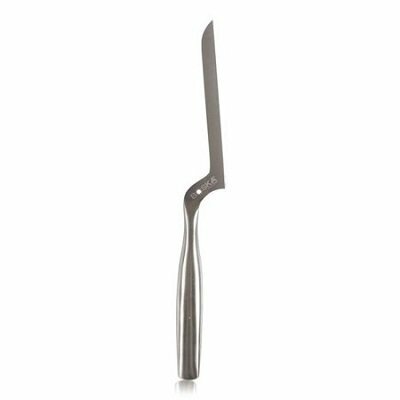 You have the dual prong fork for serving cubed Cheddar cheese, a sharp blade knife for cutting the harder texture cheese. For softer cheese, there is the rounded knife and a spreader for crumbly cheese. Being stainless steel, you can expect them to be durable and lightweight. Being dishwasher safe, that will make light work of cleaning up. However, manual washing is easy too and might be better as using the dishwasher in the long term can cause the blades to rust as mentioned by some users. What a stylish and elegant hostess you’ll look cutting and serving cheese to your guests using this modern cheese knife set. Your guests would also enjoy using these knives themselves. 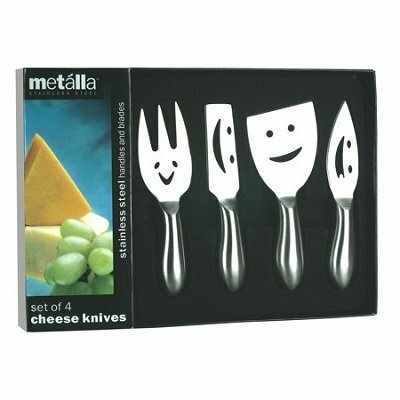 This fancy and sophisticated 4 piece stainless steel cheese knife set in gift box would certainly make a great housewarming gift whether for cheese lovers or those who love to entertain.